Rain has been the predominant weather pattern during much of my trip to Estonia, with more expected in the coming week. A day with a sunny forecast has become a precious gift, mapped out carefully, appreciated fully. Today was that day. In the morning, I went to Nöo to find Viinamärdi, the farm Silvia writes about in her memoir. Thankfully, I was guided by an Estonian who has himself made many excursions to seek out the ephemeral quality of space that shape meaning. Like pilgrims of old, we set out together in search of Silvia’s Viinamärdi. The Estonian National Archives in Tallinn had helped me find the location and maps discovered in their collection. With these maps on my cellphone, we drove past the city limits of Tartu. Billowing clouds greet us on the horizon; rye fields sway into a distant silvery green. In thirty minutes, we arrive at Luke Manor, an old Baltic German estate with a written history that stretches back to 1557 although thought to be established in 1299. In 1925, when the farm was purchased by Silvia’s family, new histories had gained a foothold, and the grounds of the manor had long been divided into three smaller properties. I was searching for Veski-Viinamärdi, Viinamärdi 3, or as Silvia calls it, simply, Viinamärdi. The grounds of Luke Manor, as they exist today, are still quite expansive and remarkably beautiful. Some buildings carefully renovated, while the ruins of others are now home to bats and families of storks. Quickly we realized we were not going to find Viinamärdi without help. Thankfully, a groundskeeper is located by the sound of his machinery and he points us in the right direction. We return to the car and retrace our path, stopping at a small lake we think may match our map. Nearby, an older man is out in his yard with his dog and we ask after the history of the area. Does he know of the Nihtig/Narma house? Along the way, I had told my companion what I knew of Viinamärdi from Silvia’s writing. Of course, the fields did not help us much in finding our way, but the small lake was a good start. I also knew that Silvia had lived near a family with many children, whose father was a professor: family name Sarv. We soon discover that the man in his yard is the owner of the former property of Professor Sarv. But can the house across the street from the Sarv’s property be the farm house? I am unsure. I knew Silvia had lived near the Sarv’s, but had the Nihtig/Narma’s lived directly across the street. I couldn’t remember from the text, and the man with his dog did not recognize the name Nihtig or Narma. There was that moment of despair. I had come so far; where could it be? How would we find it with the maps we had in hand? We stand at the lake. I feel certain of the lake. There is the island the children would swim to on the weekend after all the hard work had been completed: picking berries, weeding gardens and taking the cows to pasture. Conflicted by a lack of precision, I stand at the roadside in front of the lake. The watery mirror reflecting the sky and trees in an elegant symmetry I don’t feel within. Turning, I see the man we had spoken with, hurrying down the country road. He has thought of an additional detail by which to aid our search. And then one word stands out from a conversation I cannot understand: Glaase. It is Silvia’s mother’s maiden name. 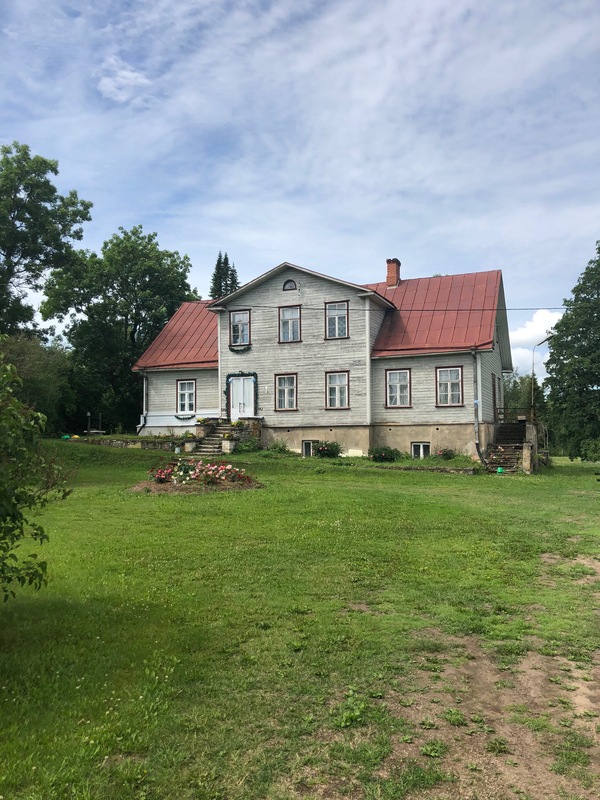 The farm had been purchased by Mart Glaase, Silvia’s maternal grandfather, as a retreat for the family to spend time together during the summer. Of course, this is the detail needed. With new certainty, we turn and see Viinamärdi. We had parked near the ruins of the historic watermill, near the front of the house. Its charred wood a reminder of the dynamite used by the Germans as they left the area in late August of 1944. The neighbor tells us we should try to ring the doorbell, although it is mid-day, and the fields would be a better place to search for the current owners. We find no one home and content ourselves with walking around, surveying the landscape, looking at flowers, and soaking in the features of a landscape. I begin to see Silvia’s words come to life. It is here in the sky and the breeze and the trees. The covered wells and cisterns still the same. The barn, less tended but standing. The front steps of the house now crumbling away, but my feet find a foothold. The lilac bush old enough to have bloomed in Silvia’s June. Returning to the car, we drive along the fields, the stands of paper birch, the wildflowers in bloom. The heady scent of meadowsweet and valerian wafting in the window from the roadside, but we find no one. Nevertheless, as we drive away, I am not disappointed. In the countryside, it is often the land itself, with its trees and streams and familiar paths that holds significance for those who live there. I feel the same love of a particular land on the mountain where my family spends the summers, naming each path or pond as if it were a member of the family. Today, I found more than a location on a map, but I know, in truth, I can never find Silvia’s Viinamärdi. For her it was more than an excursion. It was more than a place on a map; it was a place she knew intimately, one that lived inside of her. It was also a place that forever changed the direction of her life: Viinamärdi. Oh delight! Yes this. The sense of place!. Beautiful adventure! Happy to be along with you too!